Albert Knowles, a lifelong Blue who celebrates his landmark 100th birthday at the end of this month, was joined by Manchester City Legends Mike Summerbee, Joe Corrigan, Tommy Booth and Alex Williams to officially open the Etihad Stadium’s brand new Legends suite. Albert, a Far East Veteran and Branch President of the Royal British Legion in Hayfield since 1965, attended his first Manchester City game at the historic Hyde Road ground as a boy when he was just eight years old. Today, Albert can still recall the memory of his first City game in vivid detail, as well as the names of the entire 1934 squad who gave City fans a season to remember when they won the FA Cup that year. Like many Manchester City Legends, Albert has been an indelible part of the Club’s history attending City’s last game at Hyde Road, their first and last games at Maine Road and their very first fixture at the now iconic Etihad Stadium. Albert once again played an integral role in the Club’s history when he helped unveil the renovated Legends suite, a panoramic restaurant located in the new South Stand honouring the Club’s renowned players and overlooking the pitch where legends are born. 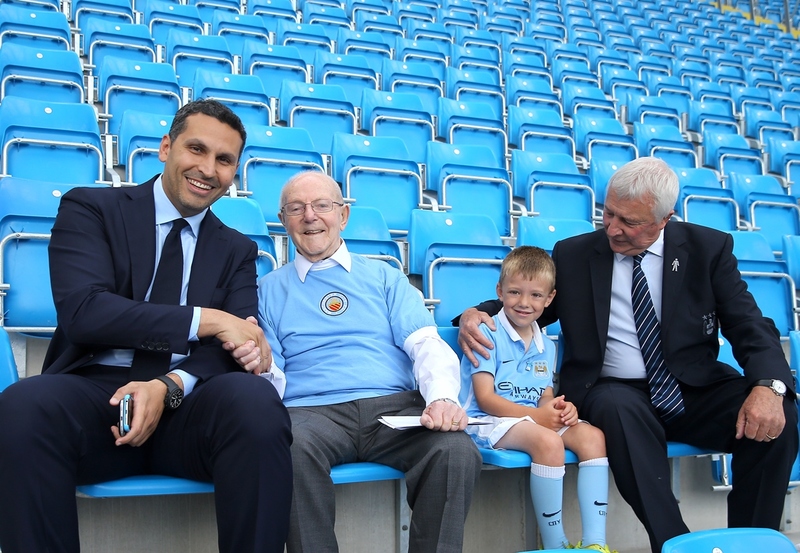 Albert was welcomed to the expanded Etihad Stadium by City chairman Khaldoon Al Mubarak, who took the time to speak to Albert and another notable fan, five year old Oliver Manuell, who is enjoying his first season as a Seasoncard holder in the South Stand. To celebrate Albert’s landmark birthday and to thank him for his infallible support of Manchester City, Club Ambassador, Mike Summerbee, presented Albert with a retro shirt signed by the Club’s current squad. Albert and his family then enjoyed the hospitality on offer in the Legends suite before watching City’s 3-0 win over Chelsea. I saw them play at Hyde Road and went to their first game at Maine Road. When they won the Cup [in 1934] they came to the Town Hall with it, everyone wanted to be there and I was there. Manchester City officially opened their all-new South Stand, which adds 6,000 more seats to the Etihad Stadium and, together with the additional 1,500 pitch side seats, brings the Stadium’s capacity to more than 55,000.